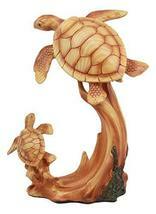 This Swimming Turtle Family Statue measures 9" tall, 7" long and 4.25" deep approximately. This Swimming Turtle Family Statue is made of high quality designer resin, individually handpainted and polished to resemble wood. This beautiful masterpiece will make a wonderful decor for your desks, shelves or what have you! Color tone may vary from pictures.